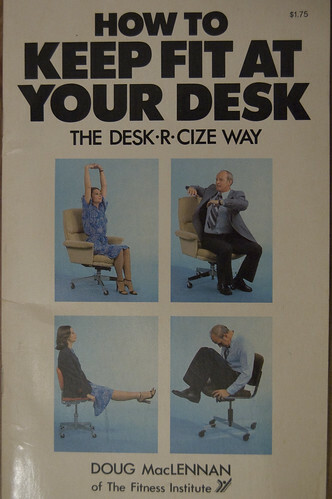 You may wonder, "Is the Desk.r.cize program right for me?" Ask yourself these questions. Are you white? Are you secretly dreaming of being a ballerina while you work at your desk all day? Is your tie wide enough? If you answered any of these questions, Desk.r.cize is perfect for you! The Desk.r.cize program should not be undertaken without consulting your friends and family first. 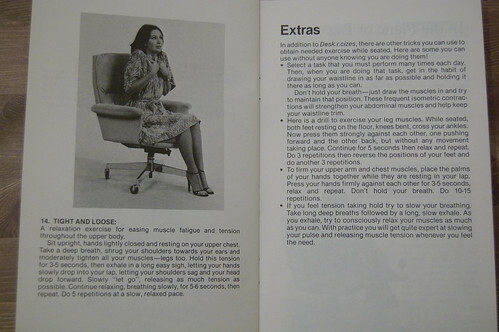 Also, be sure to have your coworkers on hand to laugh hysterically as you embark on your new, fitter, lonelier lifestyle! Note: We have used black & white (Kidding. They're only white.) people to illustrate these techniques, but please feel free to wear whatever horrible fashion you would normally wear to the office. 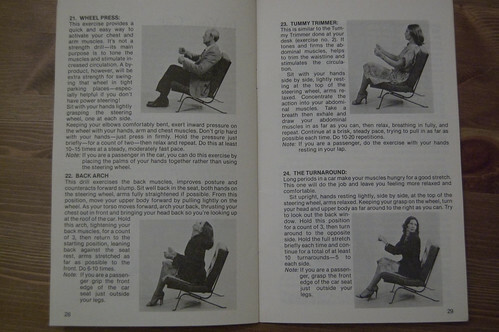 Clockwise from top left: The I-can-alsho-talk-wifout-moving-ny-liphs, The Airplane Landing-over-water, The Completely Strung Out, The Invisible Ottoman. Clockwise from left: The Grabbing the Dropped Pen without Looking, The Office Nod-off, and the Hold It In It's Not Break Time Yet. Left: The Squeaker. Top: The I'm So Excited! Bottom Right: The Hallelujah! 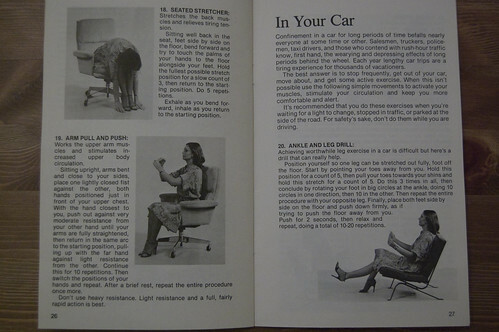 Top Left and Right: The Imaginary Carpool. Bottom left: The OhGodOhYesOhGodOhYes. Bottom Right: The I Hope No One Just Saw That. Thanks for playing along! 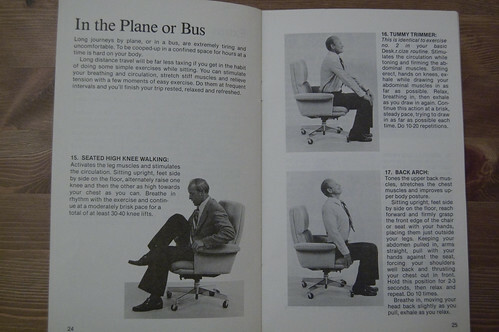 Now, go ahead and embark on what will surely be an active chair-bound day at your office. 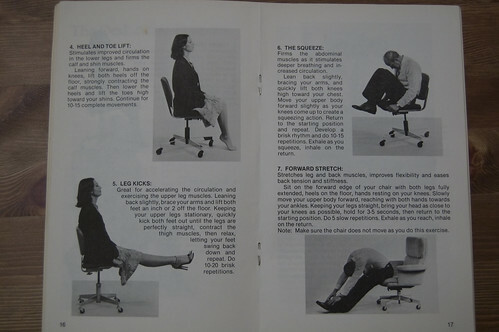 Be sure to share these moves with your coworkers for maximum social benefit. 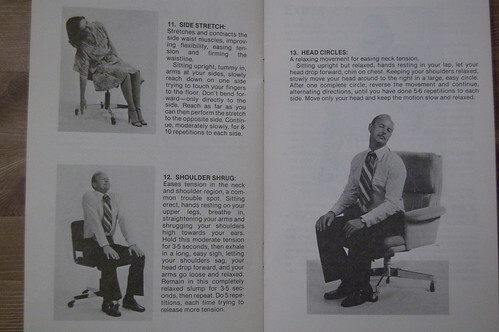 If I ever walk into my boss's office and find him contorted in that "knee to nose" position, I will faint dead away. Awesome find! I only hope that, in the future, our generation is seen to be as forward thinking and fit as we were in 1980. 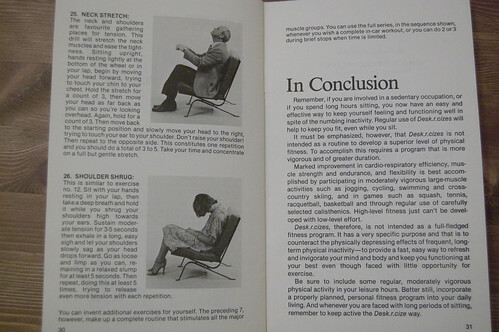 I think that a particular lady in a blue dress may have performed one of those exercises in the White House. I can't stop giggling...and it makes my abs hurt. Hey! Another office exercise. Who knew? "We have used black & white (Kidding. They're only white.) people to illustrate these techniques, but please feel free to wear whatever horrible fashion you would normally wear to the office." heh. I remember these well. 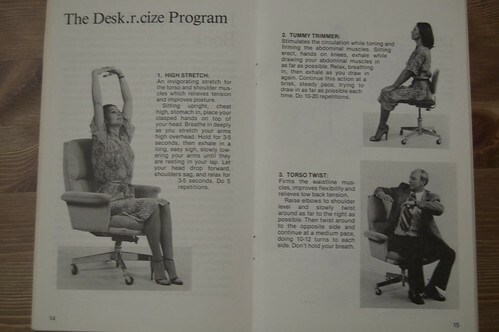 I used to stretch at work all the time. Had to...night and day hunched over a computer was killing my body. All my joints seized at one point. That was really fun! Oh my word, I nearly injured myself laughing. This is priceless. Thanks for sharing, dude! Steph: Why am I not at all surprised that you're the one who got the "redacted" reference. Awesome analogy. Mike, I will now take time out of my busy day running a muck everywhere and hauling my 95 lb. MIL in and out of the wheelchair and bed etc. 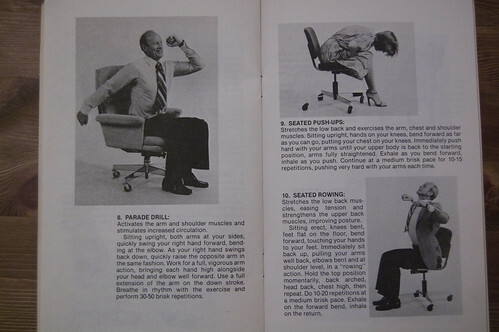 Just sweating bricks in general so that I can run in and sit in the desk chair and perform these incredibly aerobic looking maneuvers. This will surely be what puts me over the top in the physical fittness department.